Terry Labonte finished last in Saturday’s Sprint Unlimited at the Daytona International Speedway when his #32 C&J Energy Services Ford fell out with a vibration after he completed two of the race’s 75 laps. 1989 and 1990 Sprint Unlimited winner Ken Schrader was originally listed as the driver of Frankie Stoddard’s #32 for the exhibition race. However, prior to Friday’s practice, Terry Labonte, the 1985 Unlimited winner and the #32's driver for the Daytona 500, took over the ride. Labonte’s run in the Unlimited did not last long as he pulled behind the wall during the opening green-flag run, twelve laps before an accident in turn one took out six other cars. This marked Labonte’s third consecutive last-place finish in nineteen Sprint Unlimited starts. His other two last-place runs were withdrawals from his last two Unlimited starts in 2005 and 2006, where he was set to run the #44 Kellogg’s Chevrolet in the former and the #96 DLP HDTV / Tweeter Chevrolet in the latter. Prior to that, Labonte led a career-best 17 laps in the 2004 running and finished 8th behind winner Dale Jarrett. Prior to this race, Labonte was one of seven drivers who had more than one last-place finish in the Unlimited, joining John Andretti, Geoffrey Bodine, Derrike Cope, Jeff Gordon, David Pearson, and Ricky Rudd. 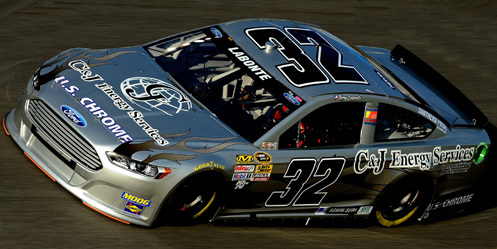 With this third finish, Labonte now has more last-place finishes in this event than any other driver. *This was the first last-place finish for the #32 in the Unlimited since 1995, when Chuck Bown withdrew his Active Trucking Chevrolet from the Busch Clash. Bown was joined by Ernie Irvan, who was unable to run the #28 Texaco / Havoline Ford due to life-threatening injuries he suffered at Michigan the previous summer. *Labonte is the first driver to finish last in the Unlimited due to a vibration. Vibration = Start & Park. That's why Schrader was out of the car. He thought he was going to get a chance to race. When he found out he wasn't he left and they put Labonte in the car. Thank you for the information, Steve. Where did you hear about Schrader refusing the ride because of the plan to park? The reason I ask is because I have to be very careful about concluding whether a team has actually parked or not. As you know, it's tricky since the TV broadcasts don't cover the lower-end teams very well. That's why I prefer to take the listed "reason out" at face value.